While conducting detailed analysis of the local news for each of the three cities, Pew Research also tracked the major issues that were covered during the weeks examined. 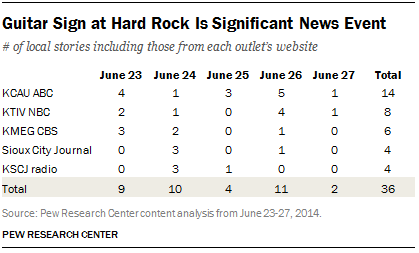 In both Denver (June 16-20, 2014) and Macon (June 9-13, 2014), no specific themes dominated the news agenda. In particular, no single storyline accounted for more than 3% of the week’s stories (excluding sports, traffic and regular weather forecasts). Sioux City, however, was different because of the multiple weather events that plagued the area leading into the week of June 23-27, 2014. Three of the top five stories involved damage and recovery from flooding, storms and tornados. 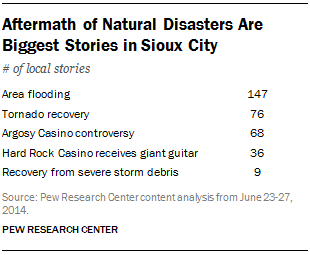 More than one-in-ten stories (11%) in Sioux City was about the area’s flooding. 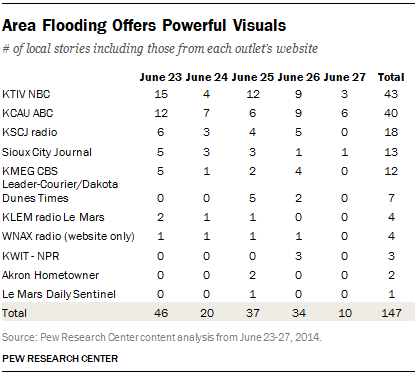 Combined, the three major weather-related subjects accounted for 17% of all stories. In all three cities, the coverage of the major stories was generally driven by commercial television and to a lesser extent by news radio and newspapers. 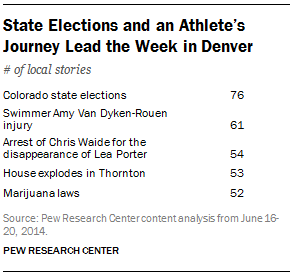 The subject matter of the five most-covered Denver storylines for the week varied widely—from the upcoming Colorado primary elections to the recovery of an injured Olympic swimmer to the legalization of marijuana. But no individual storyline dominated the week’s agenda, and the amount of attention given to each of the top five stories was similar. The number one subject had 76 stories—3% of all of the Denver stories (excluding sports, traffic and weather), while the number five subject had 52 stories—2%. The storyline that received the most coverage during the week of June 16-20 was the upcoming statewide primary elections the following Tuesday, June 24. Primaries were being held for governor, U.S. House seats, state Senate seats and the Colorado State Board of Education. These elections attracted media attention across a wide variety of Denver news sources—including commercial legacy outlets, community newspapers, cultural publications and web-only sites. Two aspects of the coverage differentiated this storyline from virtually all the others: first, the story was covered by more individual news providers (21) than any major story in any of the three cities examined, and second, the local television outlets were not leading the way. 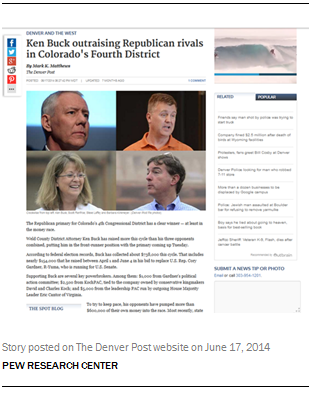 The Denver Post produced nine stories on the election during the five-day period. Most of those stories focused on the amount of fundraising that was conducted by various candidates. And the Post’s website included a page devoted to local politics which was a major location for news on the election for consumers. Virtually the same number of election stories was offered on radio (19) as on commercial television (18). 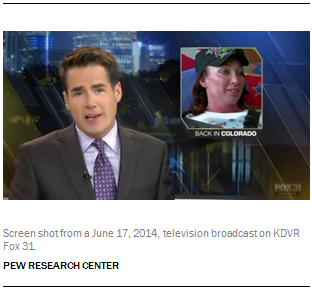 Seven of the TV stories came from one station, KDVR Fox 31. Close to half of the radio stories (8) appeared on conservative talk show host Mandy Connell’s show on KHOW, six of which consisted of interviews with three of the Republican gubernatorial candidates—Bob Beauprez, Scott Gessler and Mike Kopp. KGNU radio offered one very different type of story—a discussion between two Democratic candidates for the Board of Education. No media sector other than radio presented any interview-based election stories during the week leading up to the primary. Almost half of all of the election stories (34) focused on the gubernatorial race, while just three highlighted the race for seats on the Colorado State Board of Education. Throughout the week, most of the stories focused on overviews of the races, differences over issues, fundraising details, or commentary about specific campaign ads. One exception was the June issue of the monthly Asian Avenue Magazine, which featured a “Get Out the Vote” design on its cover and devoted five of its 32 pages to four separate election-related stories—three of them geared toward the Asian American community. One of these highlighted an analysis of the Asian-American electorate, another featured a statement on why it was important for Asian Americans and Pacific Islanders to get involved in elections, and the third focused on an Asian-American candidate for the U.S. Congress from Colorado’s 2nd District. 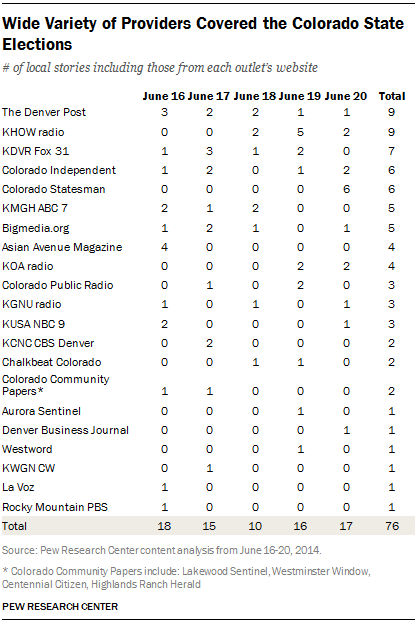 Two small niche publications in Denver provided more expansive coverage of the state election than most of the other outlets—the online nonprofit Colorado Independent and the Colorado Statesman, a weekly nonpartisan political newspaper. Each of these publications offered six pieces on the election. Stories on these two outlets were much longer on average—706 words for the Statesman and 1,238 words for the Independent—than the stories from either the websites of the broadcast networks or the web or print versions of The Denver Post. Of the two longest stories run by the Colorado Independent, for example, one (around 1,500 words) was a detailed examination of how the defeat of U.S. House Majority Leader Eric Cantor, the Virginia Republican, and the issue of immigration reform might affect the 6th District race between Republican Mike Coffman and Democrat Andrew Romanoff. Another substantial piece in the Independent was an article that combined descriptive text with a 10-minute video produced by reGENERATION Colorado, a millennial generation political advocacy group. The video took viewers along on a visit to the homes of three of the four Republican gubernatorial candidates. The longest piece from the Colorado Statesman was a 1,250-word, three-page article focusing on Democrat Ed Perlmutter as he kicked off his campaign in Wheat Ridge for a fifth term in the U.S. Congress. It was accompanied by 16 photographs from the congressman’s campaign. Considering the entirety of the election coverage, state-level agencies or politicians were the most cited sources. State-level agencies or politicians were cited in 22 stories (31%), while citizens were cited in about half that many stories (17%). City-level politicians were cited in 10%, while voices of national politicians were present in 8%. The number two story in Denver was driven by television, whose coverage generally consisted of brief updates. Amy Van Dyken-Rouen, a 40-year-old, six-time Olympic gold medalist swimmer, severed her spine in an all-terrain vehicle accident in Arizona on June 6. Van Dyken-Rouen, a native-born Denverite who is married to former Denver Broncos punter Tom Rouen, is well known in the area. The commercial television stations were responsible for 75% (46) of all of the stories on the subject, either on their broadcasts or websites. The local CBS affiliate led in terms of volume of coverage with 14 stories, while the ABC affiliate was second with 10. Eight stories were carried on commercial radio (KOA) and five in The Denver Post. The remaining two stories appeared in community newspapers. The framing of the coverage shifted from day to day as the story evolved. Stories on Monday and Tuesday concentrated on general details of Van Dyken-Rouen’s recovery, her departure from the intensive care unit and the news that she was expected to travel back to Colorado for rehab. Coverage of the story spiked on Wednesday as she arrived in Colorado and was brought to the Craig Hospital in Denver to begin therapy. Thursday’s stories continued a focus on her return but with an emphasis on her positive attitude, her shout-out to fans and her activity on social media. By Friday, attention to the story dropped sharply. While most of the stories were short, there were a few exceptions. For example, a 2,000-word story on the Denver Post website included interviews with two paralyzed athletes—one of whom was a high school friend of Van Dyken-Rouen and is now head coach for the U.S. Paralympics Swimming National Team—to get their perspectives on what she might be going through. 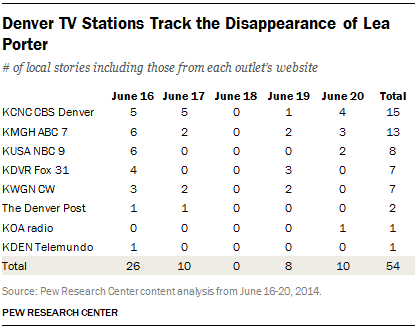 The subject with the third-largest coverage in Denver was about a missing person, and it was covered almost exclusively by television. On June 5, a 19-year-old woman named Lea Porter from Pueblo had been reported missing after visiting a high school acquaintance, Christopher Waide, in Westminster, a northwest suburb of Denver. The reasons for her visit were not immediately clear, and it was subsequently determined that she had actually gone missing on June 3. Her car was located in the parking lot of Chris Waide’s apartment complex. Waide was arrested on June 12 and charged with suspicion of sexual assault and murder. His first court date was Monday, June 16. Then on Thursday, June 19, Waide was formally charged with murder, even though Porter’s body had not been found. Of the TV stations, the CBS affiliate devoted the most attention to the case with 15 stories, and the ABC station was second with 13 stories. The local NBC, Fox and CW stations offered much less coverage, with eight, seven and seven stories, respectively. The only other outlets to cover the story were The Denver Post (two stories), radio station KOA (one story) and Telemundo Denver (one story). Media attention to the case fluctuated widely over the course of the week. Almost half of all of the stories (26) appeared on Monday, the day that Waide made his first appearance in court, even as the search continued for Porter’s body. Ten stories ran the following day and none at all on Wednesday. Interest in the story picked up again toward the end of the week, with eight stories on Thursday—when Waide was formally charged with first-degree murder—and 10 more stories on Friday when Waide made another appearance in court. Almost half (43%) of all of the stories contained the voices of ordinary citizens, many of whom were people who were connected to the events. A Fox KDVR report aired on June 16, for example, included clips of Porter’s stepfather describing how he felt that Waide would not be in jail if he—along with a few other individuals—had not taken it upon themselves to go to speak with Waide. The fourth story was a “made for TV” house explosion in a suburban neighborhood that provided dramatic live images that were broadcast in close to real time. On Thursday, June 19, shortly after 3 p.m., a house in Thornton exploded near 131st Street and Monroe Drive. Debris was found a full block away. There was no immediate word on what caused the blast. One person was missing, and early reports suggested a cadaver dog might have found a body. As of the next day, the missing person had not been publicly identified. 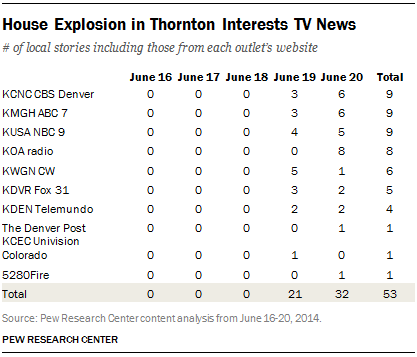 Ten news outlets in the Denver area carried stories about the house explosion. 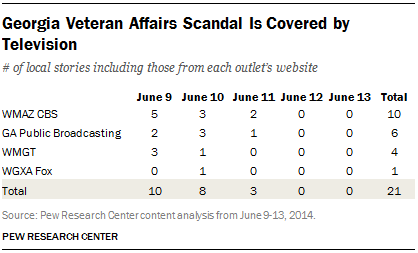 Seven of the ten were television outlets that, together, produced 81% of all of the coverage. Unlike two of the other big stories identified in Denver for the week, here, three of the four major networks (KMGH ABC, KCNC CBS and KUSA NBC) all produced the same number of stories (nine). KDVR Fox and the KWGN CW produced five and six stories, respectively. Among those commercial TV stations, this was also overwhelmingly a broadcast story rather than an online one—37 of the 43 stories (86%) they produced were for broadcast (including the two Spanish-language stations). Apart from the TV stations, three other outlets provided coverage of this story on Friday. The Denver Post produced one print story; 5280Fire, an online-only news source dedicated to firefighting in Colorado, had one story; and KOA radio had eight short anchor reads in its morning segments. Ordinary citizens were cited in 62% of the stories. These were primarily neighbors who recounted where they were at the time of the blast, what they were thinking, what they heard or witnessed and how they reacted. 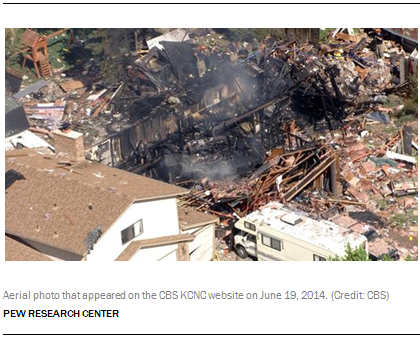 A KCNC CBS late news report that aired on June 19 contained an emotional interview with one of the homeowners, Susan Smith, who told how she had learned of the explosion that destroyed her home as she drove back from work. She voiced concern about her missing roommate as well as her two missing dogs. One of the dogs, an eight-pound Chihuahua, was later found to have survived the blast. Unlike most of the top stories, the fifth-largest was not focused on one specific event or thread. Instead, the legalization of marijuana in Denver drew a variety of coverage with many different angles. On January 1, the first recreational cannabis stores opened in Colorado, and the issue drew consistent coverage. Twelve news outlets reported on the issue of marijuana, producing a total of 52 stories over the week studied. 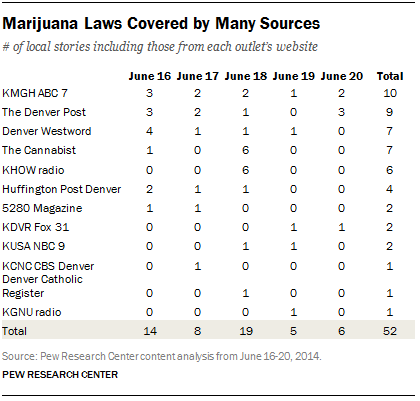 And two of the smaller outlets, Denver Westword and The Cannabist, a Denver Post standalone vertical, produced almost as much related content as did the TV stations. The individual mainstream outlets paid varying amounts of attention to the story. The ABC affiliate was the clear leader among the television stations—producing 10 stories and at least one story each day (the only outlet to do so). 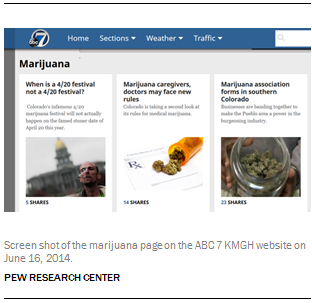 The ABC website also offers a marijuana vertical under its “News” tab, although that page is rarely updated with news stories. Three other TV stations (CBS, NBC and Fox) paid comparatively little attention to the issue, producing only one or two stories each, and the CW station did not produce any stories at all. The metro area’s major daily newspaper, The Denver Post, offered nine stories that touched on a variety of marijuana-related issues. For example, on Monday readers would have seen a wire story about how legal pot growth can be used as evidence in child custody cases and another story saying that burglaries at Denver marijuana shops are at the lowest level in three years. On Wednesday there was a story about how Tom Tancredo’s position had become a campaign issue (the former congressman was running for governor) and on Friday there was a story about a shipment of hemp seeds bound for Colorado that had been seized at the border. Two radio stations also paid attention to the marijuana issue—notably on Mandy Connell’s KHOW talk show. On Wednesday, within the first two hours of her show, the conservative host had six segments for a total of almost 15 minutes where callers voiced their opinions. This discussion followed a lengthy interview with gubernatorial candidate Mike Kopp. Several callers weighed in on Kopp’s stance on marijuana, as well as whether they felt it was hypocritical to be a small government conservative and also oppose the legalization of pot. On Thursday, KGNU’s “Morning Magazine” presented a lengthy interview with a cannabis correspondent for Boulder Weekly that focused on a survey about risks for teenagers as well as some problems with a Drug Enforcement Administration report. There are two niche outlets in the Denver area that feature significant amounts of coverage about marijuana—Denver Westword, an alternative news publication with a marijuana vertical, and The Cannabist, which focuses on all aspects of marijuana. Together, these two publications produced 14 stories about pot over the course of the week—which constituted close to 30% of the overall coverage. For example, Denver Westword offered an opinion from an advocate saying police officers should be allowed to smoke marijuana, a review of a medical marijuana dispensary and stories on how Denver plans to spend tax revenue on marijuana. The Cannabist produced pieces focusing on Pope Francis’ opposition to the legalization of marijuana, how Vail had extended the moratorium on recreational sales for another year and that a hotel posted a sign saying how it was “friendly” for marijuana users. 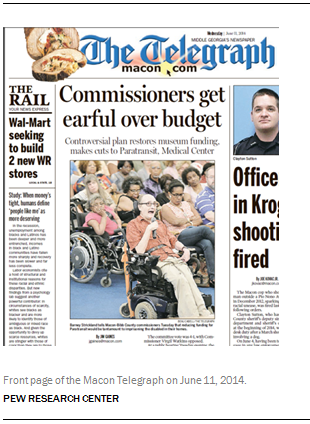 In Macon, the role of legacy, daily news providers in shaping the largest stories of the week was even more evident. With only minor exceptions, the only news platforms to cover the top stories of the week were the Macon Telegraph and the television outlets. The community papers and topic-focused outlets gave almost no coverage to these stories during the week studied. 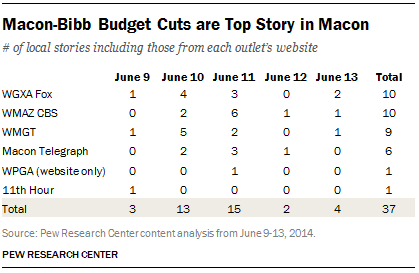 The most covered story the week of June 9-13 involved the consequences of potential budget cuts. Almost none of the nontraditional outlets covered the story, which meant that the information available to the public about the budget came almost exclusively from legacy news providers. 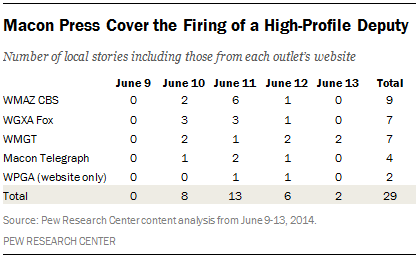 All but one of the 37 stories on the topic came from daily, traditional news outlets. On the morning of Tuesday, June 10, the first Macon-Bibb County consolidated budget was approved by commission’s Operations and Finance Committee. Because of state law, the committee had to come up with a balanced budget. To do this, the committee proposed a number of funding cuts to areas such as transit and medical centers. Tuesday evening, the commissioners held an open hearing and heard criticism from groups worried about possible funding cuts. The Macon Telegraph ran six stories, while the television stations produced 30. Only one other outlet, the 11th Hour, an alt-weekly magazine, had any news about the controversy during the week examined. The situation had been an ongoing subject in the community, but the news this week focused mostly on the Tuesday night hearing. The day prior, there were only three stories in anticipation of the vote on the budget—one was a 104-second anchor voice-over story on WGXA Fox, while the other was a story on the WGMT website. On Tuesday, the three major television stations produced 11 stories. Those stories averaged 102 seconds, and six of them were edited packages. All the stories focused on what parts of the budget might get cut, such as museums and health care. Wednesday was the busiest day in terms of coverage as the public hearing became the focus. The lead story in the morning print edition of the Telegraph was about the hearing, as was the most prominent story on its website. Television carried nine stories, and two of the television sites’ web pages also had stories. By late in the week, coverage of the issue decreased. On Thursday, the Telegraph had an opinion piece on the subject, while only one television network (WMAZ CBS) produced a piece—a two-and-a-half minute package on the effect on indigent care in medical centers. Friday, the story was given a new angle as hospital employees signed a petition opposing the proposed cuts for medical care. The TV stations aired four shorter anchor voice-over stories (with an average length of 72 seconds) on the petition. Of the 37 stories about the subject throughout the week, 54% quoted a city politician or agency. Interestingly, the party affiliation was not noted for any of the politicians cited. The firing of Clayton Sutton—the week’s second-most-covered subject—was notable because he had been involved in several high-profile incidents in the recent past. And as was true with the budget cuts, this story was covered only by the major news outlets. Sutton, a white Bibb County sheriff’s deputy, shot and killed a black man outside a Pio Non Avenue Kroger on December 12, 2013. The incident sparked political and racial unease in Macon. (Sutton was later cleared of wrongdoing.) In March 2014, Sutton was involved in another shooting incident with a dog and was ordered to desk duty. Then, on June 4, he disobeyed the sheriff’s orders when he engaged in law enforcement activity by stopping people who were “acting suspiciously.” Finally, on Tuesday, June 10, Sutton was fired. The firing was announced that afternoon. All three of the TV stations aired multiple stories, and that night a story appeared on the Telegraph’s website. The story was also a front-page story on the Telegraph’s print edition on Wednesday, and television coverage continued. WMAZ CBS produced six stories, while WGXA Fox produced three and WMGT one. On Thursday, all three television stations reported on Sutton’s appeal. WMGT was the only outlet to stay with the story on Friday, as it aired two more stories also regarding the appeal. The vast majority of the sources cited in these stories came from official police statements (79%), although the Telegraph did get a quote from Sutton on Wednesday in which he stated he was not allowed to talk to the media without approval from the department. About a quarter (28%) cited a citizen. Besides those two groups, no other type of source was quoted among the categories examined for this study. The third-largest story of the week involved a violent and tragic crime. The nature of the crime and the police department’s dramatic announcement placed the story at the forefront of TV and newspaper coverage early in the week. On Monday, June 9, Macon police arrested three people for an attempted robbery and murders that occurred on May 29. 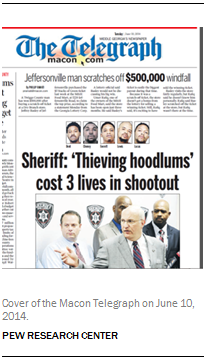 The sheriff referred to the suspects as “thieving hoodlums” and said they were known criminals in the community. Vincent Lewis, Quintavious Everett and Rayshawn Reanaldo Lucas were arrested in the slayings of Arika Jarrell, 23, and Ralph Heard, 32. During the incident, the robbery suspects exchanged gunfire with the victims, and one of the robbery suspects, Terrance Dent Jr., was fatally wounded. The Monday news conference announcing the arrests was a large media event. The Telegraph website had a story about the charges and offered a video of the entire presentation. That evening, all three television stations reported on the story and included footage from the news conference. The Telegraph put the story on the front page of its print edition on Tuesday, and its website posted a gallery of 23 pictures from the news conference and previous events, such as the memorials for the victims. Two of the television stations (WMGT and WGXA Fox) aired follow-up stories, both reporting on the continuing search for a fourth suspect, Lewis Cheney, who had not yet been found. On Wednesday, all of the outlets except for WMGT continued reporting on the story. The Telegraph’s website posted a story suggesting that Vincent Lewis was tied to another assault-rifle attack. Thursday, WMAZ CBS and WGXA Fox aired stories about the continuing search for Lewis Cheney. As was the case with the Sutton firing, the only sources cited in these stories were police (59%) or citizens (11%), suggesting that the reporting on this subject relieved heavily on official sources for information. The fourth-largest story of the week did not involve Macon directly but was newsworthy because it came on the heels of a national story and involved several medical centers throughout Georgia. The story was unique because it was the only one of the week’s most covered issues where the local public radio station devoted any coverage—albeit not very much. Another difference was that each outlet that provided coverage did so in different ways. The U.S. Department of Veterans Affairs released a report on Monday, June 9, that showed that the average wait time for new patients at the Atlanta VA Medical Center was about 64 days for a primary care doctor, nearly 53 days for a specialist and almost 27 days for a mental health professional. Recent criticism of the national VA system for the same issue added to the visibility of this report. The three VA medical centers in Georgia were flagged for review. However, all three are more than 50 miles from Macon, so it was a statewide story, rather than a local one. Unlike the other major stories of the week, this subject was reported in very different ways by the traditional outlets. Some, such as WMAZ CBS, gave a fair amount of coverage to the subject, while others, such as the Telegraph, did not report on it at all. On Georgia Public Broadcasting, the story was frequently reported as part of the local inserts in the middle of the national NPR broadcasts. All of these stories were fairly short and consisted solely of anchor reads. On Monday, GPB aired the same 20-second story twice. On Tuesday morning, GPB repeated the same story again. However, by Tuesday afternoon, the station was reporting that VA officials in Georgia had resigned. On Wednesday, the station ran a different 20-second story saying that a Georgia congressmen wanted to look further into the VA problems. On television, the stations approached the subject differently. WMAZ CBS covered the story the most. On Monday, the station aired four stories (average length 65 seconds) and posted one on its website. The focus was the Dublin hospital that had been marked for further review. On Tuesday, the station aired three stories, average length of 63 seconds, about the waiting times for veterans at the Dublin hospital. The station then aired two investigative stories on Wednesday about the bonuses given to the top employees at the Georgia VA hospitals. The stories were slightly longer and averaged 90 seconds. WMGT aired three stories on Monday. However, the focus was different. In two of them, the reports included a claim by Vietnam War veteran Herbert Dennard that the care in Georgia VA hospitals was excellent. On Tuesday, the station followed up with a 23-second story about 187 veterans who had been waiting three months for medical attention. The Telegraph did not report on the story at all during that week. This is probably because of the three VA hospitals in Georgia, one is in Dublin (50 miles away), one in Atlanta, and one in Augusta; none is in Macon itself. The fifth-largest story of the week focused on Gordon, Georgia, a city about 20 miles from Macon. The television stations were the only outlets to cover the story during the week studied. A group of seven people in Gordon filed a lawsuit in the spring aimed at removing Mayor Mary Ann Whipple-Lue. They argued that she was breaking the law by holding illegal meetings, spending money without authorization and mishandling city personnel records. Whipple-Lue was removed from her position as mayor after Judge Robert Reeves entered a temporary restraining order on June 2. On Monday, June 9, Whipple-Lue’s attorney filed a motion seeking to remove the judge who suspended her from the case. Her lawyer asserted that Whipple-Lue would not get a fair trial if Judge Robert Reeves presided over it. Virtually all 17 stories about this case were focused on the lawyer’s filing to remove the judge. On Monday evening, the three TV stations aired a combined nine stories that averaged 60 seconds in length. Tuesday morning, WMGT ran two more TV stories while WMAZ CBS and WGXA Fox each aired one on their broadcasts. 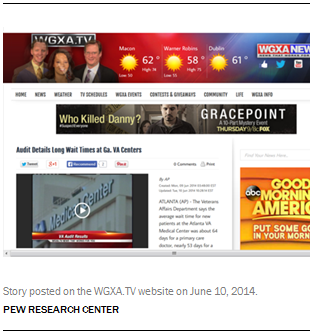 Both the WGXA and WMAZ websites also had stories. There was little new information in these stories compared with the previous night. The only story the rest of the week was on Friday evening when WMGT aired a 23-second voice-over piece reporting that Whipple-Lue may have been removed from office in an illegal way. The Macon Telegraph did not cover this story this particular week. However, a search of the Telegraph’s own website showed that the paper did cover the story before and after the week studied here. The other fifth-largest story was a straightforward arrest. 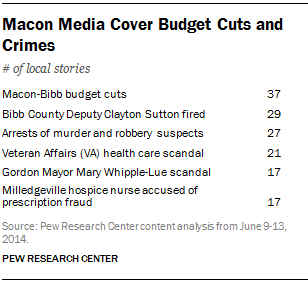 All of the major outlets in Macon reported on the story, but none devoted much time or resources to it. 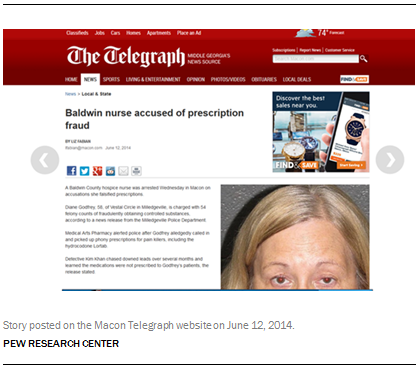 On Wednesday, June 11, a Baldwin County hospice nurse was arrested in Macon on accusations that she falsified prescriptions. Diane Godfrey, 58, was charged with 54 felony counts of fraudulently obtaining controlled substances. On Thursday evening, all three television channels aired stories on the arrest. Of the seven broadcast stories, six were voice-overs only. The only other story was a package on WMGT. In all, those seven stories averaged 48 seconds in length. That same day, the WGXA and WGMT websites each had a single story on the topic. The Macon Telegraph published a story about the arrest on its website on Thursday. The following day, the print version had a 110-word story in an inside section of the paper. The aftermath of severe storms and flooding dominated news in Sioux City, Iowa, for the week of June 23-27. Three of the five biggest narratives of the week revolved around recovery efforts in and around the Sioux City area. The other two stories were both about casinos, a topic that had its own vertical on the website of the Sioux City Journal. By far, the largest story of the week in Sioux City—and the largest story of the week in any of the three cities examined—was the severe flooding that occurred in Iowa and South Dakota as a result of heavy rains and rising rivers. Unlike any other of the major issues, this subject received coverage from the majority of news outlets in the area. On June 17, Iowa Gov. Terry Branstad (R) issued a disaster proclamation for six Iowa counties. After another week of heavy rains and rising rivers, the Big Sioux River crested on June 22. Although the worst of the damage occurred prior to the week studied, the fallout and recovery efforts received media attention throughout the five days examined. Even though the amount of coverage provided by different outlets varied greatly, the content of most of the stories were similar. Most focused on the most recent developments regarding the flooding and where people were offering help to those affected. The majority of coverage came from traditional, legacy news sources. TV stations and their websites produced 95 stories, while 29 stories came from commercial radio properties and 13 stories originated from Sioux City Journal. Community papers combined for a total of 10 stories. While all the TV stations covered the subject, the amount differed. KTIV NBC (43 stories) and KCAU ABC (40 stories) covered flooding news much more than other outlets. The third TV station, KMEG CBS, had far less coverage, with only 12 stories about the flooding. On Monday, there were 46 stories, the highest amount among the five days studied. Local TV combined for 32 stories. A majority of these stories were voice-overs, and only KTIV NBC provided live coverage with two staff reports. Most stories focused on the sustained flooding in Rock Valley and Akron, Iowa, and recovery efforts. The Journal produced five stories that day. Tuesday had fewer stories (20), Wednesday saw an increase in coverage (37 stories) as many sources focused on the removal of the Riverside levee that began that day. Officials of the Federal Emergency Management Agency visited the damaged area on Thursday, which also drew widespread coverage. 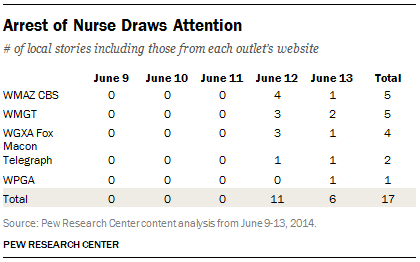 News coverage trailed off some by Friday. Most of the 10 stories that day focused on volunteers’ cleanup efforts. An examination of the coverage of the story in its entirety shows that politicians and members of the public were the most cited sources. State and local politicians were cited in 39 stories (27%), while citizens were cited in 32 (22%). The second-largest story in Sioux City carried a similar theme. Several tornadoes touched down in Pilger, Nebraska, between June 16-18, and the coverage of the cleanup and recovery was heavy at the beginning of the week. 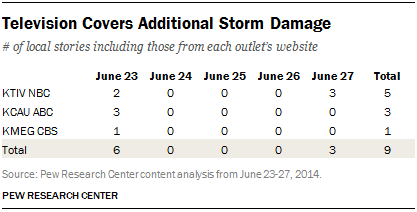 Unlike the flooding recovery, however, there was a noticeable drop-off in stories after Monday, June 23. Almost as many outlets covered the tornado recovery (nine) as did the flooding (11), although the overall number of stories was about half as much. An even greater proportion of the coverage of the tornado aftermath came from the television networks, as 80% of the 76 stories were produced by the stations or their websites. Unlike the flooding story, that meant there was far less coverage in other outlets. Commercial radio produced only seven stories, while the Sioux City Journal had four. In another similarity, the CBS affiliate devoted less of its coverage (seven stories) to the tornado recovery during the week than the other two commercial channels. Monday had the most coverage, but the story trailed off after that point. There were 38 stories on Monday, June 23, but by Tuesday there only 14. The next three days saw fewer than 10 a day. Only one provider, KCAU ABC, had a story all five days of the week studied. On Monday, most of the coverage stories focused on residents returning to damaged homes and community meetings aimed at organizing the cleaning of the debris. Most of these stories were broadcast anchor voice-overs, and there was no live coverage. The rest of the week included coverage of the impact of the weather and some contained information about how viewers could help with the cleanup efforts. 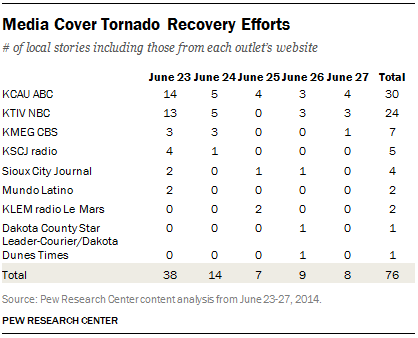 Unlike the flooding stories, the tornado-focused stories cited everyday citizens more than any other type of source. In total, 31 stories cited an everyday citizen, while 14 cited a representative of the city. The third-largest story in Sioux City was of a very different nature—a controversy over gambling. And although the focus was on a riverboat located in Sioux City, it was an issue that involved a statewide agency. Since it was a controversy with differing opinions, the story was a good topic for one particular talk radio station. That outlet, however, was the only place were members of the public could weigh in on the topic. 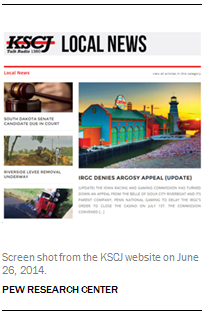 In April, Iowa’s Racing Gaming Commission ruled that Argosy Casino was in violation of a law that requires casinos to partner with a nonprofit group, and therefore the commission did not renew the riverboats’ license. On June 23, Argosy Casino sought an emergency stay against the motion so that it could stay open. The Monday hearing drew some press coverage, and several media outlets discussed the issue throughout the week. On June 25, Argosy’s request was denied. While television stations produced 39 stories on the subject, the issue was especially popular on commercial talk radio station KSCJ. The station featured 14 segments on the topic, six of which came on the show called “Good Morning Siouxland.” Five others appeared on the locally focused “Open Line with Charlie Stone.” Stone devoted a large portion of his Thursday program to the issue where he declared his opposition to gambling businesses and allowed callers to share their feelings on the issue. KSCJ was the only place where an opinionated conversation about the issue could be found in the sample studied. All of the reports coming from the other providers were straight reports rather than editorial pieces—demonstrating that despite the clear controversy, local citizens had few opportunities in the media to share their views. On Monday and Tuesday, there were only a few stories about the casino’s move. The story picked up on Wednesday after news broke that the appeal to stay open was denied. Of the 21 stories reported that day, two-thirds were produced by local TV stations. On Thursday, there were 28 stories that focused on the aftermath of the appeal’s rejection. 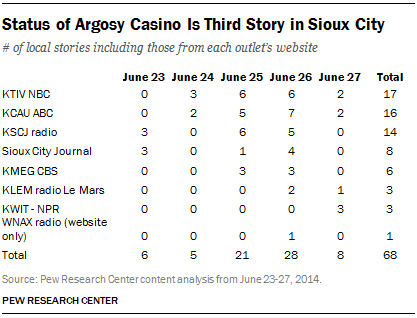 That day, the Sioux City Journal produced four stories, one of which appeared online and polled its readers on whether the casino should stay open. By Friday, the coverage had died down to only eight stories. These mostly wrapped up the latest details of the casino’s closing, including what date it would be shut down. Only local TV and local radio covered the story this day. The fifth-largest story focused on a feat of human ingenuity. 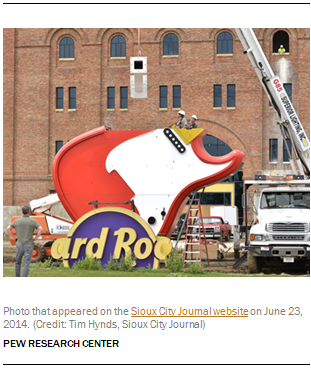 The Hard Rock Hotel & Casino Sioux City on June 23 received sections of a 50-feet guitar to display outside its building. The story was made for TV because of its interesting visual. Of the 36 stories about the project, all but eight came from one of the commercial TV properties. Most of these stories were short pieces with footage of the construction while anchors provided a voice-over. All three of the TV stations covered the story, but to different degrees. The ABC affiliate devoted at least one story a day all week and produced 14 stories overall. The NBC and CBS affiliates offered eight and six, respectively. The story received coverage for five straight days, despite the fact that there were no major developments. Stories focused on the assembly and installment of the guitar, and that work proceeded each day without significant new details emerging. There was also little depth to the coverage. Ten stories quoted a business figure, mostly from the casino itself—which provided the viewpoint of the business. No other kinds of people were used as sources, and 26 stories had no sources at all, signaling that the coverage offered no other perspectives to the creation of the large symbol. As if the region did not experience enough difficult weather, the fifth-largest story of the week involved damage and debris left by storms other than the tornados. Storms in northeast Nebraska along with parts of Iowa and South Dakota caused damage to many farms and added to flooding in the area. All the stories on this topic appeared on the three commercial television stations. On Monday, stories tended to focus on the damage and debris left from the storm. The three stories on Friday focused on volunteerism and impact, including one story on KTIV NBC that discussed how the storms might affect the Siouxland school district for the next academic year. Once again, the CBS station aired only one story while the other two stations offered more. However, the story on KMEG CBS was the only one of the nine reports to be an edited package rather than a brief anchor read. On June 23, KMEG led its evening broadcast with a two-minute report on farms that had been destroyed by the storms.